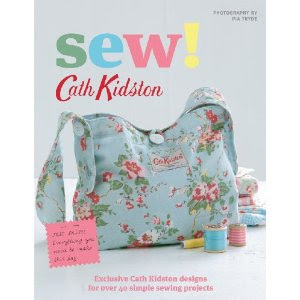 Last Christmas I received as one of my gifts a book called ‘Sew!’ by Cath Kidston . I’ve always liked her fabrics and now that I have made a few of the items I thought I would share my experiences of the book with you all. First of all the book lists 41 projects so I am a long way away from completing them all. They range from bags, cushions, tablecloths to aprons and baby/kids decorations. The book starts you on your way with some basic instructions of various sewing techniques. I think these are well written and fairly simple to follow. Next the book comes with a large paper pattern piece, this is the kind where you trace over the lines you require and cut out on new paper. I’m not a huge fan of this method purely because I can only ever seem to lay my hands on small and stiff pieces of paper which are quite frankly rubbish for pattern making. But if you can locate something thinner/larger it shouldn’t be too much of a problem. The book also has some applique templates at the back which could come in very handy. 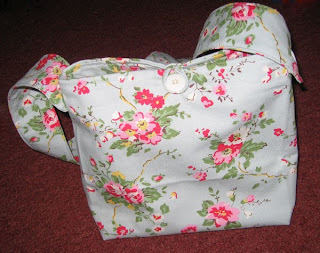 I think I’m going to make the knitting needle case next as mine is looking rather shabby. I would say that most of these patterns are fairly simple, if like me you appreciate the fact this means you can whip something up in a morning then you’ll be in heaven. But for some this book might just be telling you what you already know but with pretty pictures. On the other hand if you can pick this up on special offer the fabric contained makes this a good deal in itself so still worth the purchase. So I would definitely recommend this book, it certainly gives you lots of ideas you can run with and of course your not limited to their fabric/decoration choices. If your from the US I did some checking and this has not yet been published, but it’s coming in Oct this year so not long to wait.